Charles McPhail, the second Commodore, and his wife May were walking at Whickhope one day and there below them on the hillside, men were working, putting in the moorings…. before the lake was completely flooded. The mooring buoys were the pink ones, similar to those around the lake now. Tenders were pulled up on the shore just above the water line. There was a jetty. That was all there was. 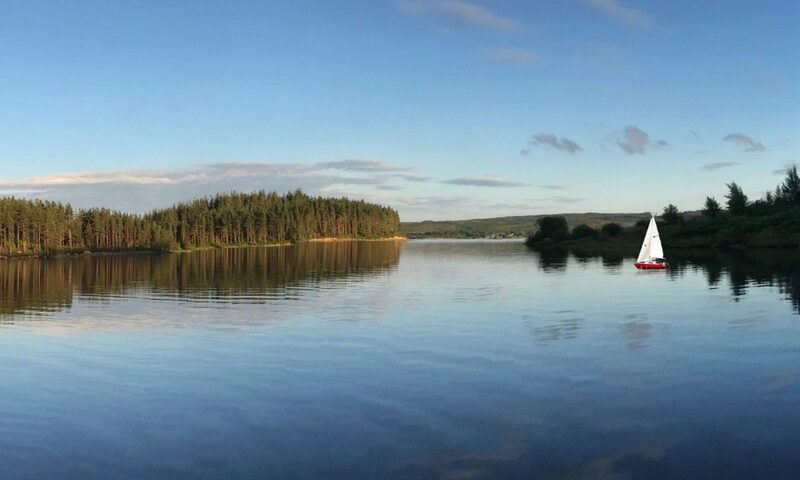 The clubhouse, at this time, was still a green hut at Leaplish, shared by all sections of Kielder Water Club, who were the Sailing Club, based in the bay at Leaplish, the Yacht and Motor Cruiser Clubs, who sailed out of Whickhope, and the Ski Club. Their area was the large bay east of the Leaplish headland. It was 1981. The shed, a cricket pavilion from Annfield Plain, costing £300, brought over and put up by members, had not yet come to Whickhope. This was finally put up and declared fit for use by a Works Officer in October 1983. ‘Resolution’ (lain MungalI) and ‘Fable’ (Charles and May McPhail) were the largest yachts, most members sailing in 15 to 22 feet size, not in the comfort experienced today. Racing was popular, members were keen, but all the races were friendly. There must have been some bad weather, but those days seemed to be sunshine and racing winds. Membership had increased to 63 by 1987. The Motor Cruising section was still separate. After many years, in 1985, because both sections sailed at Whickhope, it was suggested it made sense to amalgamate the Motor Cruiser Club with the Yacht Club. This finally happened on January lst 1993 under the Yacht Club name. Two mooring buoys, bow and stern, and laid north / south against the prevailing winds caused much discomfort for the boats and eventually, in 1983, they were re-laid east to west. Much later, in 1989, these were changed to the swinging moorings we have today. It cost £150 per mooring plus diver costs of £300 a day to install the swing moorings. This was paid for by the £6,000 per year paid through Kielder Water Club to Northumbrian Water for maintaining the moorings. The clubhouse at Leaplish, the green hut, was formerly the construction site laboratory which was re-erected about where the Leaplish conference centre and swimming pool is now. Everyone had to take a turn at galley duty, which became more controversial and a nuisance as some good sailing weather was missed. In the beginning, the building was also shared by the Reivers of Tarset who ran a boat hire/sailing school from it before they got their own building at the head of the west slipway. Their building is now the Bunkbarn. Caroline Waitt was the first “Water Sports Officer” and she dealt with registration, not only for club members but also for the large number of day visitors who brought their own boats to Kielder in the early years. Caroline served for the I982-84 seasons and she was strict. Yachts and owners had to conform to Northumbrian Water Rules, for example, flares on board were checked and all boats had to pass an engine noise test before Caroline allowed them to stay on the water. Boats on moorings at Whickhope did not escape, on one night 20 were broken into. Following this many members avoided using strong padlocks on the cabin door, better to have a broken padlock than a smashed door. After many negotiations, Northumbrian Water (before privatisation), built a magnificent new clubhouse, at an estimated cost of £300,000, which is now the Boat Inn at Leaplish (This is much changed from the original building). Grants were applied for from the English Tourist Board, who wanted the toilets to be made public. The clubhouse was opened by David Scott Cowper on Monday, 6th June 1988. David Scott Cowper, who practised as a Newcastle Solicitor, is renowned for sailing round the world and is / was frequently away sailing (or trapped in ice) in northern waters. Sadly, the plaque which commemorated the event of the opening and the organisations who had funded the clubhouse, has disappeared. Les and Pat Ferguson were appointed as wardens for the 1988-89 season and they lived in the upstairs flat in the clubhouse. Pat ran the galley. Evenings and socials were held in the clubhouse as the clubs continue to do in their own premises, but again, it was for all three sections. Les and Pat left to become stewards at the Royal Northumberland Yacht Club at Blyth. Gordon and May Greensill came shortly after Pat and Les. May followed on from Pat with more excellent cooking for hungry sailors. They stayed until 1991. Rumours had begun that Northumbrian Water wanted the building for themselves…. or to share it. Launching and retrieving was at Leaplish. Easy enough to launch with cars, but Yacht Club members then had to sail or motor to Whickhope to their moorings. Ferrying cars between the two places caused some headaches, one family member / friend, had to be available to collect the car and return it to where it was needed. Sometimes this involved walking from Leaplish to Whickhope or vice versa. Many people were certainly very fit in those days! At the end of the season, most yachts were stored over the winter at Leaplish, in the car park, which was not as large as it is now. Some boats went to the scouts at Hawkhirst and some were taken home. It was a full day. Again, members had to sail / motor to Leaplish and then help each other to haul out using cars. Later on, for well over ten years, John Richardson was helping at launch / haul out with his tractor. Umpteen members in the club have John to thank for sorting out their trailer / boat problems as he, frequently, was waist high, or above, in the water. Nothing was too much trouble for John and members owe a huge debt of gratitude to him before their own ‘ tractor crew’ came on the scene when John decided he could no longer continue with this demanding work. More negotiations and finally, in 1991. Northumbrian Water approved the plan for each section to have their own clubhouse and their own area. The Sailing Club chose Tower Knowe and the Yacht Club stayed at Whickhope, as the Ski Club did in their own bay. The other two sections’ clubhouses were made of whole log construction. The Yacht Club’s was half log. Originally, it was intended that the cabin Northumbrian Water had used at the Gateshead Garden Festival would become the clubhouse, but that never materialised and what is there now was built. Not in the original agreed position however. The main windows should have been facing down the inlet. Members began using the clubhouse from April 1993. The official opening of the new clubhouse was on the Sunday of the August Regatta 1993, by Sir Michael Straker, who was given Honorarv Membership of the club and he remained interested in us until his early death a few years later. There was a marquee in the car park and invitations went to the other sections, and many visitors were invited to the splendid buffet lunch. Celebrations went on well into night time. The midges joined the company then as they do now. Once the sections split up, and became totally centred in their own areas, each club began to grow and get more and more facilities. The marina built at Leaplish in 1988, which Kielder Water Club had offered £2000 towards, was towed to Whickhope and moored where it is now by October 1993. When the marina was first put in at Leaplish it was deemed to be a great success provided the wind blew from the south or west only. The shed (or store) at East Wickhope was kept for a few more years. It was finally demolished sometime in 1999. It had served the club well, progressing from nothing to porta-loos and parties. Trailers stayed where they had always been stored. The jetty at Whickhope remained, since refurbished by members. Each year since has seen more progress to comfort. Larger yachts and motor cruisers appeared, sadly, the enthusiasm for racing lapsed and members began to stay overnight on their boats. Social evenings continued, from meals served by Doreen and Sadie from Bellingham, to the ‘special’ evenings now and the Pie and Pea suppers. The ferry was also booked for the club some years for an evening tour of the lake with supper on board and sometimes with themed fancy dress such as ‘pirates’, and ‘millionaires’. The Yacht Club membership is good and constant, always determined by the number of moorings available. Several Sailing Club members moved from dinghies to yachts, some so they could sail together with their families, others just wanted something larger with a little comfort. The Yacht Club and Sailing Club continue to share sailing events with each other, such as the Yacht Club Regattas, and yachts are always welcome in the Round the Lake races. Contact with the Ski Club is less easy because of having to avoid sailing into their bay, but friendships made when members were one club at Leaplish have continued and are as strong today as they were then.